Simple Things: We've been robbed! Ack!! I can't believe someone would do this -- how dishonest! -- I have removed the post and I apologize for having put it up. Glad you caught it, and took care of it - folks, why would you even think to borrow someone else's dog for your website?! :( Geeze! And Laurie, huge kudos for taking it down fast and removing the post, too." I'm trying to figure out why they would even want to have their Pembroke looking like it was right beside sheep, grinning and not paying attention. 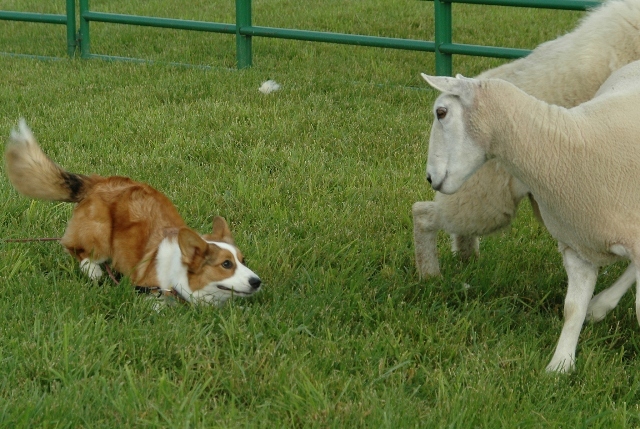 Missed the original Daily Corgi post, darn it. Didn't have any blogging time today until just now. people are so weird!!!! it doesn't even look good. lol what's the point? Janet, I'd like to post the original photo on The Daily. It's just great. I won't do so without your permission, though. Is there a photographer's credit I should include? I saw the original post when it was on The Daily Corgi and I remember wondering why the person had tampered with the shot as it didn't look real, all glowy and such. Now I know why! It doesn't make sense why you would use someone else's picture to make a brag for your own dog. Geez, the least they could've done is done a decent job Photoshopping it. I see Scout's wacky coat - Nick's is still an odd mix of puppy fuzz and that long silky coat like Jon Farleigh has. His head and neck look like a lion's mane though! The link you have posted goes to a memorial page for Beth Magnus? Was that intended? Dina - that is the first tab on the website. After the site owner removed the tab with the photo-shopped pic, the link defaulted to the first tab. I have removed the link now - thanks. Hi!! It's terrible when people steal photos, and even more terrible when they edit them to suit themselves. I think I found the infringing photo on Google images, and I wanted to tell you that you can report it. 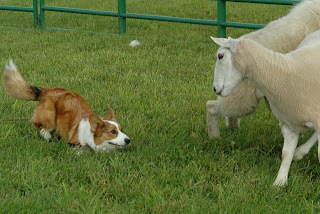 I did a search on "herding instinct test," and found it. After you find the image in the search results, go to the bottom of the page and click on "Report Photo." Them scroll back up to the infringing photo and click "Report." Mommy has a few websites of her own, and she's had to send lots of cease and desist letters over the years. Good luck getting it removed!